One day in Ba Na Hills Da Nang, you will enjoy 4 seasons in a year. It is considered as a paradise, with many interesting sights and attractions. Every year, it attracts many domestic and foreign tourists. If you are planning to travel to Da Nang – Ba Na Hills, here is the experience for your whole trip. 2. 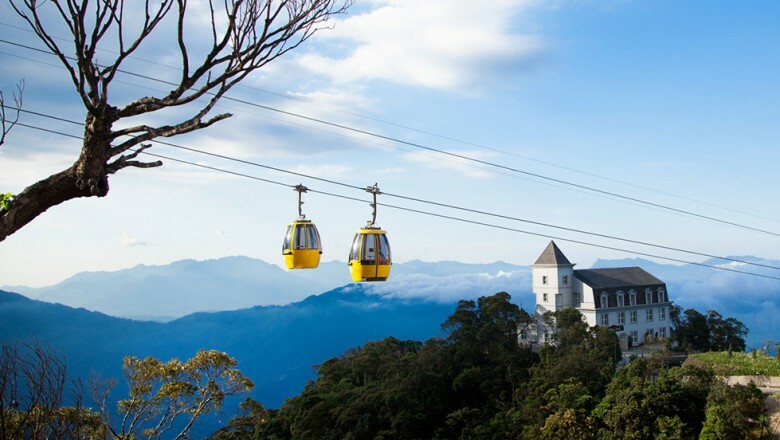 How to get to Ba Na Hills from Da Nang? 3. Where to buy Ba Na Hills tickets and what prices? 5. What to eat in Ba Na Hills Da Nang? 6. Where to stay in Ba Na Hills Da Nang? 7. 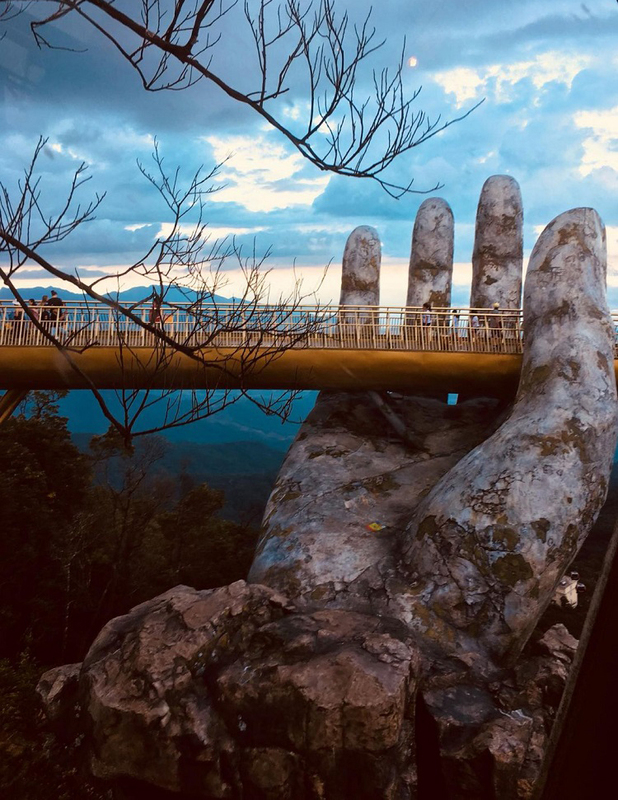 What to buy in Ba Na Hills Da Nang? 8. Where to play in Ba Na Hills Da Nang? You should travel to Da Nang from April to September each year, because this period is less dew, vibrant and bustling, you won’t be bored with Ba Na Hills weather. During the period from November to January, Ba Na Hills weather has many dew, cold weather, inconvenience when strolling sightseeing. Car: when traveling with a group, the best option is to hire a car for more convenience and initiative. If there is a driver, the cost (including the waiting cost) for a 4 seat car is 650,000 VND, the 16 seat car is 950,000 VND. If you can drive yourself, of course it will be cheaper. Private bus: is a type of car coupling to Ba Na. The trip is at 8am and at 3pm – 3.30am, return price is around 150.000 VND / person. Pick up at the hotel or home should be quite convenient for visitors. You can contact through hotline 0913 81 81 07 – 0988 159 152 to book tickets. Motorbike: with young, energetic and fleeting, you can rent a motorbike to Ba Na Hills Da Nang. But be determined as “deputy” for the weather and a little bit of energy. This will be more fun if you are in pairs or groups. The road is quite wide and beautiful but a little winding so you keep walking and running, while taking advantage of the scenery and safety. Note that the road leading to the peak was banned: “motorcycles are not exempted.” So you can go motorbike to Suoi Mo station, then buy cable car to Ba Na. The cost of renting a motorbike is in the range of 100,000 – 150,000 VND / day depending on the type of car. At the cable car, you buy Ba Na Hills cable car tickets to the top of Ba Na at the ticket counter at the foot of the mountain. On the weekend or travel season, tickets at the ticket counter have to queue for a long time. Lining will make the baby feel tired. Therefore, you should book Ba Na Hills tickets at Ba Na Hillss office at 93 Nguyen Van Linh, Hai Chau, Da Nang in advance. – Prices do not include visiting wax museum, cotton picking and carnival skills at Fantansy Park. – Bring Ba Na Hills tickets if you have pre-ordered. – Because Ba Na Hills Da Nang is very wide, walking on foot will be painful. Should you use shoes, or low shoes, slippers to move. – Prepare a sun hat or frosted cap in the morning. In the afternoon / evening, you should bring a cool shirt because it is cool in the evening. – Take food by yourself and eat in the lounge area or in the amusement park. This will help you save money. – Have lunch at the restaurant. This method is quite expensive because the above restaurants are also expensive. 4-star Mercure hotel; with 494 rooms; Spa, Gym and indoor swimming pool. The price of a night here is 2 million VND. You should book a room on the online booking site in the peak season. If you want to save money, you can book a hotel near My Khe Beach. Cham Stone is the only high-end souvenir shop in Ba Na Hillss with hundreds of varied and rich designs. Here you can carve a portrait or buy unique and interesting little gifts for your friends. But of course, the price here is expensive. From the stop, you will catch the first and only Mountain Climbing train in Vietnam to reach the Le Jardin D’Amour Flower Garden, Debay Old Cellar and Linh Ung Pagoda. Located at 1400m high, this is one of three pagodas of the same name in Danang. If you have visited Ngu Hanh Son, you will see Linh Ung Pagoda – Ba Na much like Tam Thai Pagoda. In particular, there is a 27m high statue of the Buddha with eight faces representing the eight stages of the Buddha’s life. As mentioned above, you can move to Linh Ung Pagoda by going to the Mountain Railway. Le Jardin D A’mour Garden will then lead down to the Temple. Also, if you want, you can also walk up the stairs leading up to the temple. This is quite interesting but much more tired. Flower garden is quite beautiful and large. The garden is divided into 9 small gardens with 9 different styles for you to take pictures. The most impressive one is the Garden of Secrets with an interesting labyrinth and Vineyard attached to the famous Debay Cellar. This is the hundred years old wine cellar built by the French. Inside the cellar, there are wine storage rooms, wine cellar stalls, bars, fireplaces and lounges. The tunnel is deep in the ground with a vibration temperature of 16-20 degrees Celsius. So it’s very cold, you should pay attention to the clothes to avoid to be cold. This is the hundred years old wine cellar built by the French. The temple is located at the highest point of Chua mountain with the height of 1487m. This place is very peaceful which can help you reduce stress after a hard working year. The temple is a place where people here especially respect and care restoration, preservation. People often go to worship, pray the peace for the whole family. It is quite different from other spiritual buildings here. Linh Phong Thien brought typical architecture for the temple in the north, including nine floors are built entirely of Lim wood. The statues of the Buddha and the eighteen Arhats were also displayed on the premises. Nestled behind the French Village, the Tru Vu Tra Quan restaurant is a very different place. From architecture, music, tea to the landscape will bring peace and tranquility. The tea here is really delicious, you should try once. -Fire Race (people over 1.2m to play)- you will drive the car to your liking with over 20 other players in approximately 600 square meters, the staff will advise you on seat belts, how to drive and directions. Employees will continuously monitor, control situations to limit collision vehicles, collide. But it is best to be careful, self-adjusting to avoid unnecessary injury, windmill- young children sit in the compartment, are staffed by a seat belt and experience the feeling of a rotating mortar. If you are at the same age, it is important to pay close attention to your child, so that children do not run when the mortar is operating. -Dinosaur Park: simulates the ancient world of animals and humans hundreds of millions of years BC. On the tour, there will be green or red buttons for you to click. Then the dinosaurs will move and emit a cry, quite lively. -Wax Museum (buy 100,000 VND / person, free of charge for children under 1.2m): this is the first and only museum in Vietnam with 41 wax statues of world stars in many fields such as actors, singers, players, politicians, etc. Each statue is full of information. 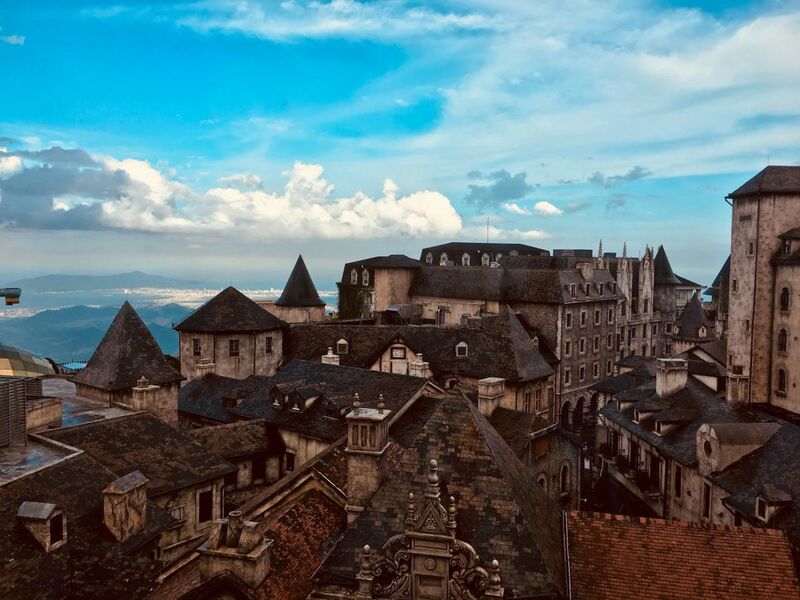 -Ghost hunting at Ba Na Hills – horror games are many young people love: you will use lasers to fire at the colored lights next to the mummies, demons, monsters. If they hit, they will move or give out screams, screams. Each time you put in 2 cents you will be 20 times shot. -4D Death Race: this is a thrilling movie with vibration, shaking, spray, smoke, and so on. The smart chair will create a real-life experience for the player. If you are a weak person, the elderly, young children and pregnant women, it is best not to participate. -Wild West 5Di: this is a very sharp 5Di film and the player interacts with the character. You will become the police chief to shoot the cowboys. If you shoot over 30,000 points you will get a souvenir of Ba Na Hills. -Snake dragon on the cloud: this is a game for kids from 0.9m – 1.2m. Babies will be worn by the staff and monitored throughout the game operation. -Knight myth: also known as the Super Slip, lies along the right ridge of Fantasy Park. Sliding 500m at 40 km / h. Sitting in the car, you will have experienced the feeling of horror through the scary crab ring, just admire Ba Na scenery with rare sight. -Fairy Forest (for children up to 1.1 m): the game consists of 6 horses with a certain safety. The baby will sit up feeling a horse running in a forest fairy. -Little explorer: A ball house, for children from 1 to 12 years old. For children under 3, parents can come along to play with their children. -Gambling: include game purchases such as candy, win tickets, beat coins, … The reward of this game can be exchanged candy or souvenirs at the Redemtion Zone nearby. -The journey into the earth: you can just sit in the car to explore the ground and try their own marksmanship. If you shoot over 7000 points you will have a souvenir. -Horror house: different from the usual horror homes, you will sit in the car and slowly move to visit the house. Screams, skeletons, coffins, scary ghosts, hands suddenly beating on the nape, … will help you have a good experience. -Free fall tower – adventure game in Ba Na Hillss Da Nang: the tallest freestanding tower in Vietnam and the region with a height of 29m. This game is not for children under 1.2m, pregnant women, people with weak health and heart disease. Each turn takes about 3 minutes, for up to 16 players. However, now the machines are old so there are only up to 8 players per turn to ensure safety. -3D mega 360: with this game you will be able to watch 3D movies “Dinosaur Baby” and “Ocean World” to experience the feeling of 360 ° rotation in the chair. You come to the port to be free to admire and take pictures with scenery as well as beautiful water orchestra at the entrance to Ba Na. Then check the cable car. Section 1 from Suoi Mo to Ba Na station. When sitting in a cabin with a capacity of 6-8 people, you can reach the Guinness World Records. Cable system will automatically along the enamel along the road to the peak of Nui Ba. From the cabin of the cable car, you can see the vast space of Ba Na with clouds, mountains, jungle, waterfall. At this time you will feel the change is quite clear when the weather passes through the sky or you will experience the feeling of adventure in the mist mixed with. The average cable length is 20-25 minutes per trip. Continue the journey, you can walk to visit the majestic Buddha 27m height which is located in the highest position in Southeast Asia. Here you will also visit the Ba Na Linh Ung Pagoda, this is a sacred temple on Chua mountain, which is covered in misty mist of Ba Na. After Linh Ung Pagoda, you can go to Deer Park and Guan Yin nearby. Then, you will go up to the second stage from Ba Na to Morin station (the third block to be added to serve from Mo Stream station to Indochine station), move by train climbing (catch From 8 am, every 15 minutes there is a trip and ends at 6 pm daily, the price of travel by mountain trains has been added to the cable car ticket). The advice is that young people take this train on the mountainside is quite fun, children are very interested. When entering the area of ​​Le Jardin D’Amour – a variety of flowers are transferred from all over the world, and Debay cellar or Peace Net Price: 70.0000 VND / ticket; Children from 1m to 1m3: 50,000 VND / ticket; Children under 1 m are free. Have lunch at Mercure Danang French Village Ba na Hills, buffet price is 200.000 VND / person or you can bring food yourself, choose a chair to rest. 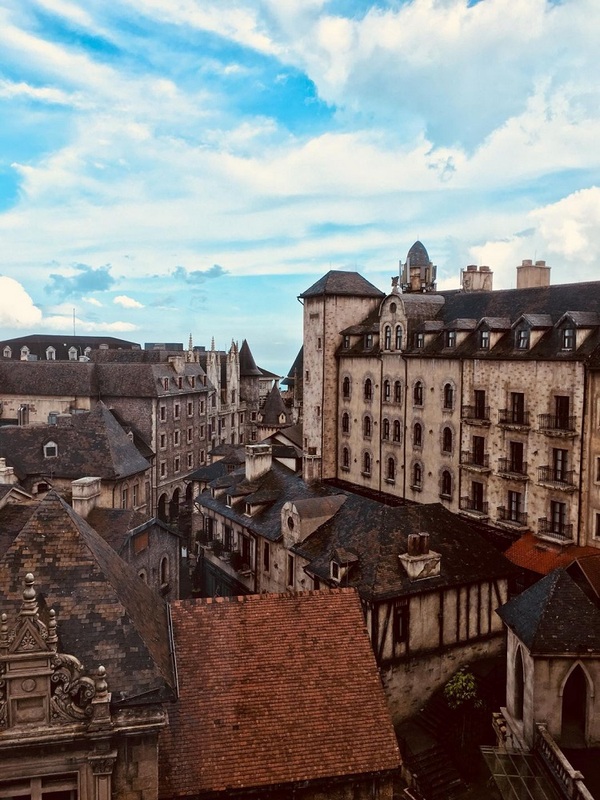 Come to French Village, you are free to watch the film and take souvenir with the landscape, the architecture. Finish and leave Ba Na with the third. If you want to stay to enjoy the cold air or Ba Na at night you can stay at the Mercure. Have dinner at Morin restaurant. Then you can relax and enjoy the evening, or stroll, watching Ba Na at night, feel the cold air here. 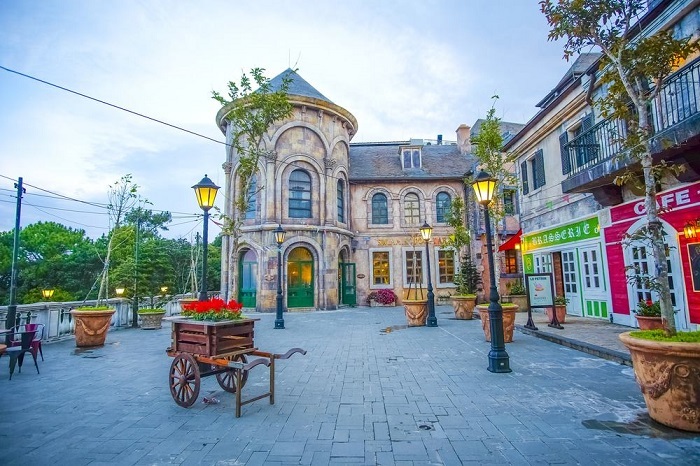 Here are almost all the interesting things you can visit, have fun – entertainment at Ba Na Hillss tourism. There are also dining, shopping, accommodation tips that you can refer. For more information about travel to Da Nang, you can read our articles. Hope you have a wonderful trip!